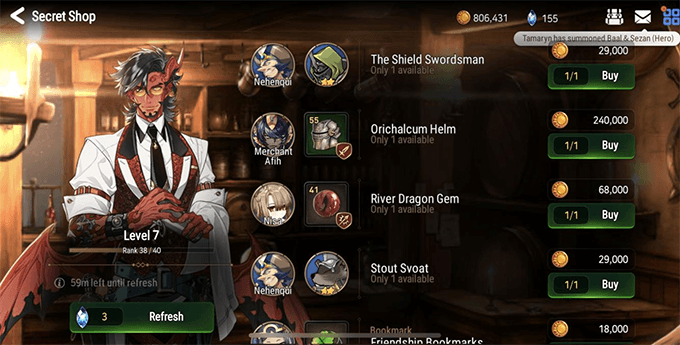 Epic Seven (or Epic 7) is a recently released mobile RPG by Super Creative Studio, a developer in Korea that is renowned for their MMORPGs. The game features gorgeous 2d graphics powered with the Yuna engine. 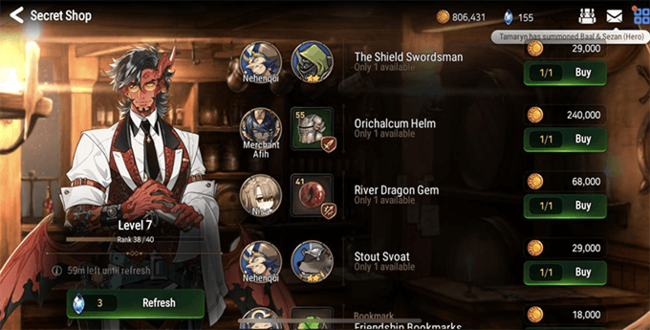 Like any sort of RPG, these games come in with a steep learning curve - Epic Seven's in-game mechanics are just as complicated as some of the mainstream games out there, and this guide here is to provide a refresher to get a headstart on what players should prioritize. As is the basis of all gacha games, Epic Seven starts off giving players 4 rolls right from the beginning chapter. After you clear the entire first chapter, you are offered a function called "Selective Summons", which actually lets you reroll up to 30 times until you're satisfied. This lets people keep one of the gacha rolls from here. 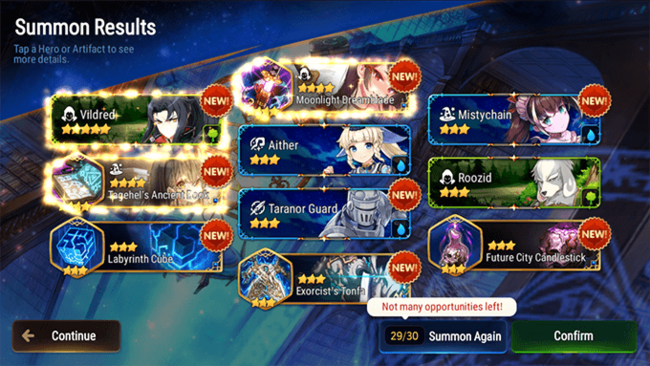 Try not to get too greedy, though, because if you pass 30 rolls, you'll be stuck with the last summons you rolled unless you start over with a new account. This will save a lot of players from wasting their time from rerolling in the game. However, if you are feeling rather desperate, you can try to reroll until you get a 5-star character during the first couple of chapters, but this is a time-consuming process and it is not highly recommended. Another factor is in order to start rolling, you will need to pick your own unique username for your account, so don't waste a good name or else you might end up with some weird generated code. In Epic Seven, no character is actually bad. In fact, some of the lower rank characters are actually superior to their 5-star counterparts when they're fully promoted to the same rank. But of course, some units are more desirable than others. The 5-star characters you should aim for are Sez, Sigret, Ravi, Haste, Cecilla, Destina, Krau, Yufine, Tenebria, Iseria. Moonlight Summon characters are not listed here as you will need to complete Chapter 10 before you're allowed to roll them. You should also complete some of the connection quests as soon you can to unlock free characters who will join your group, such as Elson and Lorina. Even though these characters are low rank, they are actually among the top tiers of heroes you can use for this game once you build them up. If you plan to hoard Covenant Bookmarks, the game does have a pity system for banners with limited characters. 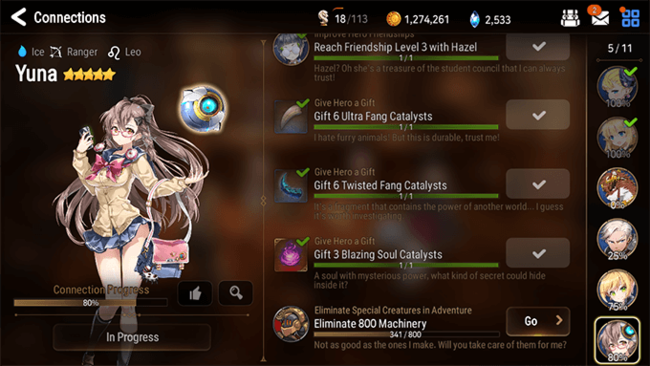 Saving enough for 121 draws will allow you to get the limited character. Equipment is actually more important than your characters. Even after rolling the best characters in the game, without having the proper tools, you're not going to make much progress in the story. Equipment is graded by several tiers, and they also have a random trait which can be linked with other equipment for an additional bonus. When you're further along in the game, you should complete the Labyrinth and the various Hunts so you can forge new and better equipment to help you survive. Any equipment that you don't need should always be used to enhance your gear. The thing is, everything can be upgraded in this game including Artifact cards. When you're upgrading equipment, you should try to enhance the gear you're using to Level 15 as soon as possible, as the stats gained at level 15 present a massive boost compared to the lower levels. There are five sources you can use to gather gear, but the equipment found on an Adventure is much lower quality than elsewhere. These are perfect fodder material to enhance your optimal gear. 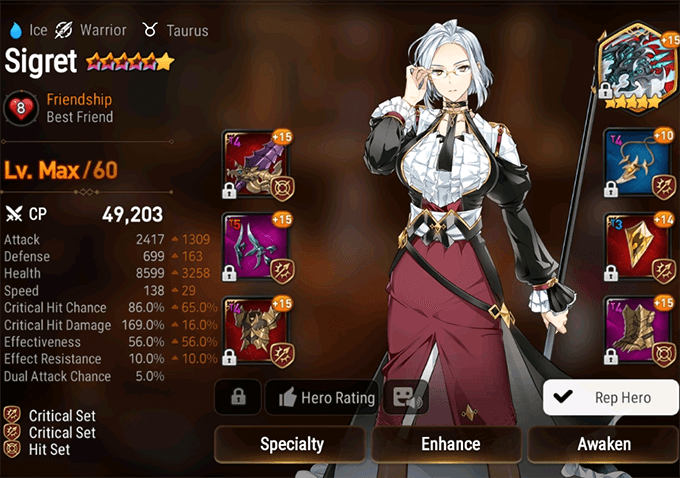 Labyrinth equipment usually has a better maximum status compared to other gear. Meanwhile, Hunt missions drop decent equipment along with materials that are used to forge new gear. However, enemies found here have a steep difficulty curve per level, you will need to learn how to manage to defeat these enemies in order to receive any reward. In Epic Seven, you should clear the main story as quickly as possible, as beating more story chapters will unlock additional functions to the game. A cool factor is some characters will join your party after you complete their quest line rather than forcing you to pray for gacha luck. By clearing the story immediately, you will get access to the Connection quest line, allowing you to finish these quest at a much earlier pace. The next valuable thing you will need to do is join a guild immediately. Joining a guild provides numerous benefits for your heroes, as they will receive a boost from rewards after combat. You can even donate money to your guild to exchange for Brave Crest. These can be exchanged for other rewards not found commonly within the main story. You can also request rare items from your guildmates or help them in exchange for more Brave Crest. The Sanctuary is an important location where you gather resources to supplement your heroes. Each location in the Sanctuary can be upgraded with the Breath of Orbis item. This item is extremely rare and only drops in certain chapters. Heart of Orbis: Receive Skystone and gold after a certain amount of time. Phantasma: This creature starts at max level, allowing you to promote them with ease. This is the most ideal fodder material to raise the rank of your characters. MolaGora Seeds: A plant that can be used to upgrade the skills of your heroes. High Command: Dispatch your units for EXP and currency. This is an easy way to level up weaker units without engaging them in combat. Steel Workshop: Forge new equipment by collecting materials you found in Hunts. As is the basis of most games, combat will be an important aspect. In order to make the best use of your resources, you will need to participate in combat while finding the most efficient way to farm so that you will gain better rewards in the least amount of time possible. You should still complete the daily quests related to these dungeons, as completing them all can give you 60 Skystones a day (the currency used for gacha). Adventures: Adventures are story segments. The enemies and equipment here are much weaker in other areas, but this is useful for farming fodder material or a quick way to complete certain quests such as defeat this monster X amount of times. They're also a good way of farming catalyst material. Labyrinth: Labyrinth is a dungeon you can explore, with the equipment here being much stronger than elsewhere. It also the only source of ancient coins, which can be used to purchase accessories from the item shop. The big thing with Labyrinth is the Morale system - as you traverse deeper inside the Labyrinth, your morale will quickly drain, and once it reaches negative 50, you will no longer be able to survive in combat. The best way to explore the Labyrinth is to look for sections you haven't explored yet, and when your stamina starts to reach zero, leave the dungeon before your party might get wiped. Then, simply return and try again on a different route. Abyss: Available after clearing Chapter 2, the Abyss is an 80-floor dungeon where you are given limited entry per day. Each floor has its own unique reward that can only be earned once. It is recommended that you keeping visiting the Abyss until you have used all your entry tickets for the day. If you don't plan on fighting here, at least use a ticket to purify the Abyss, as this will give you free gold and stigma. Hunts: In this area, you're forced to fight powerful enemies that will let you earn materials used for forging new equipment. Enemies here scale very quickly in power per each stage, so you want to come here when you have elemental advantages. Once you have found a stable way to farm this area, you should start to rely on auto-combat to save yourself the time of manually engaging enemies. Spirit Altar: This location drops elemental runes that are used to awaken your character potential. The element will rotate each day and you should focus on farming a specific element that you want your team to specialize in. Lower difficulties are also recommended if you prefer to use auto combat until your characters are much stronger. Arena: Here you can fight against another player's team. Even if you detest the idea of PVP, you can still fight an NPC's generated team for easy rewards. The benefits of participating in the Arena is that you will receive free Skystone after each week based on your rank. Players that are ranked higher can even earn up to 5 rolls or more in free currency every week. Challenge: This quest is unlocked after beating the first section of Chapter 6. Here you will fight strong bosses that can drop charms to enhance your gear. The Secret Shop is more of an endgame function that lets you buy items with gold. This function isn't worth using until you have maxed out the shop level by raising your rank. There are really good items that are purchasable from here, and it even includes endgame gear, to Covenant Bookmarks. If you have an excessive amount of Skystone and Gold, you can also use Skystones to refresh the store in order to trigger the appearance of rare items.